Carte de la Turquie d'Europe et de la Grece Moderne. 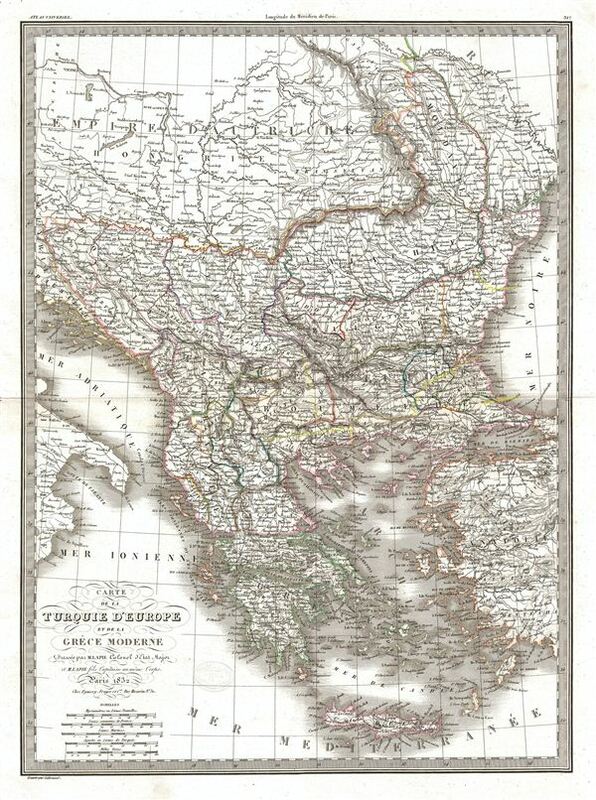 A fine first edition example of M. Lapie's 1829 map of Greece, the Balkans, and the eruopean Part of Turkey. The map covers Turkey and Greece from the Adriatic Sea and the Ionian Sea to the Black Sea. It shows Hungary, Moldova, Wallachia, Bulgaria, Macedonia, the Balkans, Bosnia, Montenegro, Serbia, Albania and parts of Turkey in Asia. As this map was being drawn, the Greek people were in the midst of a bloody war for independence against their Ottoman Turkish overlords. With the help their european allies in Russia, United Kingdom, and France, the Greek revolutionaries finally threw off the Ottoman yolk in 1832. This map was engraved by Armand Joseph Lallemand as plate no. 31 in the first edition of M. Lapie's important Atlas Universel. This map, like all maps from the Atlas Universel features an embossed stamp from the Lapie firm. Rumsey 2174.031. Phillips (Atlases) 754, 765.